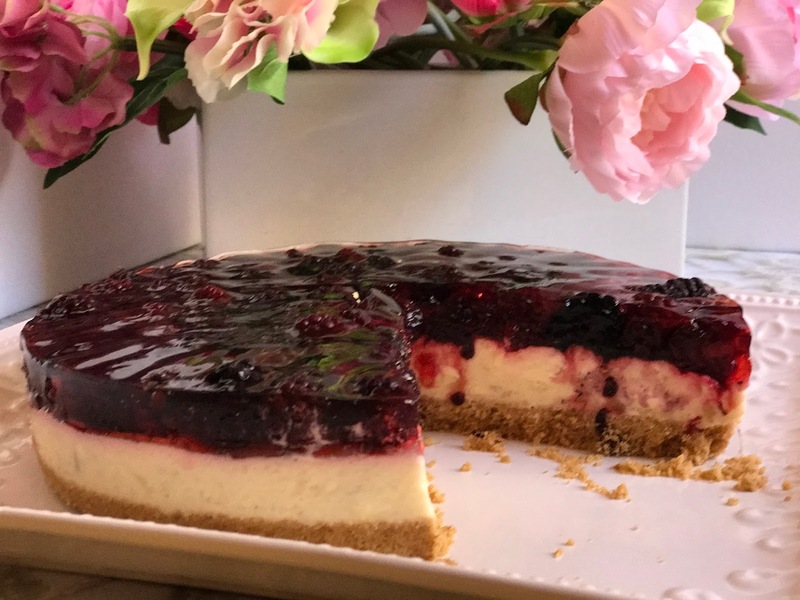 When life gives you lemons - or in this case apples - make cheesecake! I order my groceries online and mistakenly ordered 5 kgs of apples instead of 5 apples. Hence it was raining apples at Chez BeaJay. I was wondering what to make and along came the cooking show - Alive and Cooking. 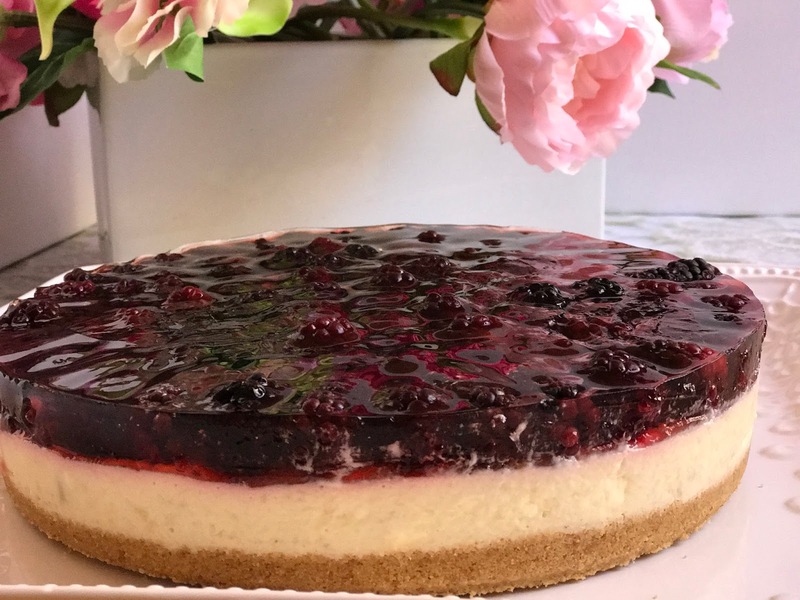 The chef made a delicious looking cheesecake that used 4 green apples in the cheese part of the cheesecake and topped it off with blackberries in jel. Yum. So here it is converted to Cuisine Companion instructions. If you make this I would love it if you came back and let me know how it went. Add butter to bowl and melt at speed 5 at 80C for 2 mins or until melted. Run on speed 12 for 1 min or until a breadcrumb texture and melted butter has distributed. Pour crumbs into a paper lined spring-form cake pan and flatten out. Press into bottom of pan and then place pan in fridge. Steam on Steam P1 for 10 minutes. Stir apple to redistribute so that it gets and even steaming. Steam on Steam P1 for 5 minutes - check apple. It will cook at different times depending on size of pieces. If done, remove steam basket from bowl and place basket over a saucepan or bowl to collect any extra liquid whilst it cools. After 5 mins remove from steam basket and place apple into a bowl. Clean out CC bowl and make sure it is cool and dry. Combine 2 tsp. gelatin with 150 ml boiling water in a jug. Add 200 grms caster sugar. Stir to dissolve and pour over the apple. Mix through and put aside to cool slightly. Add cream and 100 grms caster sugar. Whip cream for about 1 min on speed 7 – keep an eye on it. Make sure it is whipped but not over-whipped to butter. If needed, whip further for 10 second intervals until whipped. Speed 7 time 60 sec. Check that cheese is smooth. 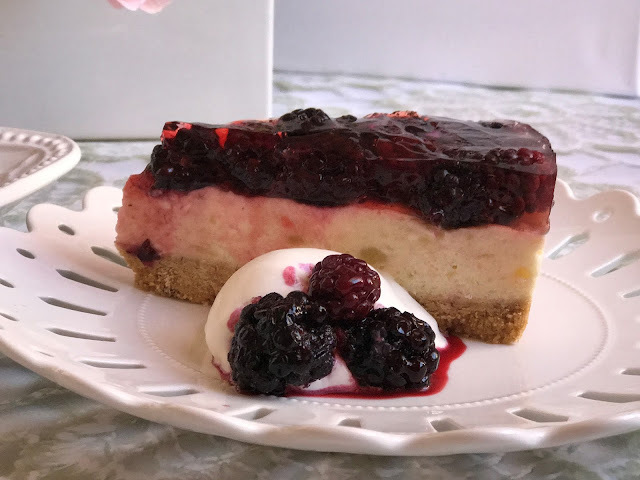 When set, arrange blackberries on top of cheesecake and put back into the fridge. Push blackberries up against the side of the tin to help keep jelly mixture from going down the sides. Add the remaining 2 tsp. gelatin into a jug with 50 ml apple juice to dissolve. Spoon 1/3 apple juice / gelatin mixture over the blackberries in small quantities (a spoonful at a time). Place cheesecake in fridge for half an hour. This helps to set the jelly a little before putting it all in the tin and risking it flooding down the sides. Gently pour the rest of the juice over the top of the cheesecake and return to the fridge for a further 2 hours or until set.